The motto of the Estonian Presidency of the European Union is 'Unity through balance'. Based in the heart of the North-East Europe and having Russia as neighbor, Estonia facilitates openness in both digital economy and society, while also ensuring security and a sustainable environment. Estonia's position in the Baltics between Scandinavia, Eastern & Western Europe makes it a skilled negotiator in finding a balance between the different views, traditions and interests in Europe today to achieve the best possible outcome for all European citizens. 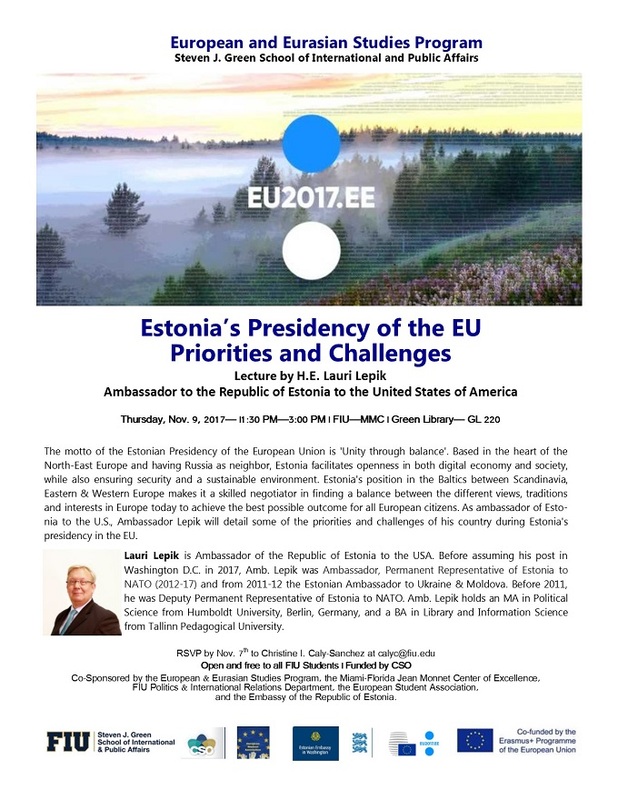 As ambassador of Estonia to the U.S., Ambassador Lepik will detail some of the priorities and challenges of his country during Estonia's presidency in the EU. Lauri Lepik is Ambassador of the Republic of Estonia to the USA. Before assuming his post in Washington D.C. in 2017, Amb. Lepik was Ambassador, Permanent Representative of Estonia to NATO (2012-17) and from 2011-12 the Estonian Ambassador to Ukraine & Moldova. Before 2011, he was Deputy Permanent Representative of Estonia to NATO. Amb. Lepik holds an MA in Political Science from Humboldt University, Berlin, Germany, and a BA in Library and Information Science from Tallinn Pedagogical University.